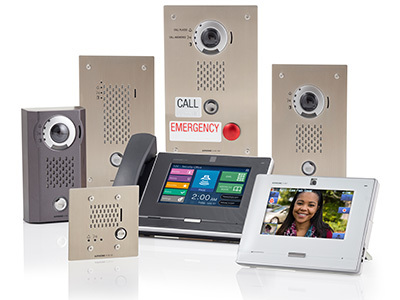 Ask people where they might see Aiphone video intercoms being used and they’re likely to name the front door of a school, an entry to a multi-tenant apartment building or in an emergency station mounted in a parking garage. However, video intercoms are valuable almost anywhere there’s a need to control visitors, communicate over an enterprise network or provide immediate assistance. That can include the rugged environment of a quarry where there’s always large machinery and vehicles on a site that’s noisy, dusty and open to extreme weather. These factors only add to the challenge operators face in limiting visitors while enabling access for those with legitimate business. One Southeastern U.S. quarry offers a good example. There’s an almost endless line of trucks and their drivers needing to check in before heading to scales used to weigh the vehicles as they enter and leave the quarry. Dispatchers must keep the entry process moving quickly or risk gridlock. An Aiphone IX Series video intercom is mounted at driver-window height at the truck entrance. A dispatcher uses the intercoms to see and speak with drivers to verify their identity before remotely unlocking the entry gate. If the dispatcher is busy with another task, the network-based system allows another of the company’s offices – maybe 100 miles away – to handle the process. Intercom conversations can be heard over the high-decibel noise level of diesel engines and background quarry operations. The stainless-steel clad IX Series units have withstood limestone dust, rain, snow and extreme temperatures – even the occasional grazing of a truck’s side-view mirror. Quarry operators have increased security, while enhancing convenience. And the video intercoms offer one more benefit. The company’s various quarry locations use the IX Series master stations to communicate between offices, eliminating the need for several telephone lines and their monthly costs. Do you operate multiple outdoor sites that require reliable security and communications over a network platform? If so, check out the latest features of the IX Series video intercoms.